Onboard the Gravytrain: feeling generous? support the rural studio! This year marks the 20th Anniversary of Auburn University's Rural Studio. It's a great program and a cause that is near and dear to my heart. 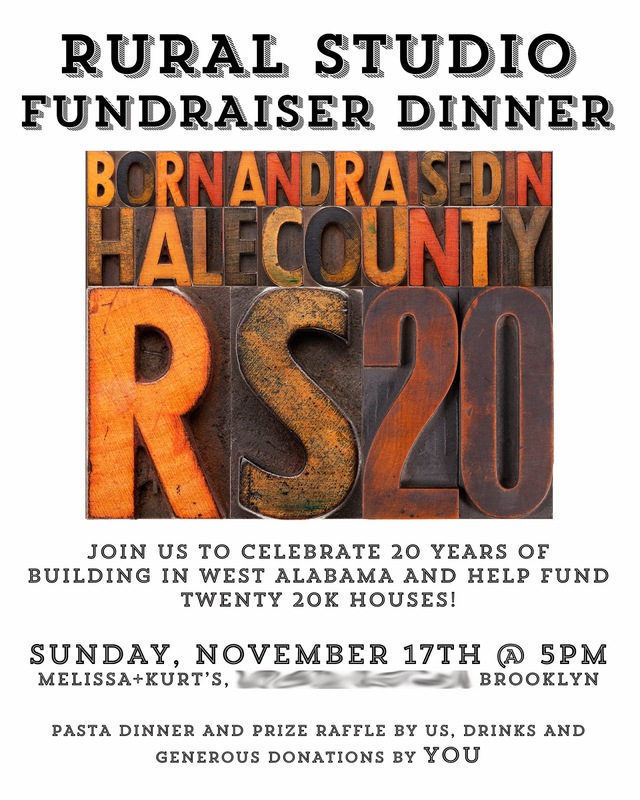 To mark the occasion, the Rural Studio is gathering the funds to build twenty 20K houses! In order to garner a little friendly competition, Rural is pitting city against city in the 20K City Challenge. NYC is lagging a bit, so Kurt and I are hosting a fundraising dinner this weekend to make our contribution to the fund. We hope our efforts can move us up in the standings! If you would like to learn more or would like to donate to the cause, email me or read more here. If you live in the NYC area and want to come to our little dinner, let me know and I'll send you the details. The more the merrier!